The First Judicial District Commission on Judicial Performance unanimously recommends that Judge Lily Oeffler BE RETAINED. Judge Oeffler was appointed to the First Judicial District Court in December, 2005. This is Judge Oeffler’s second performance review since her appointment. Prior to her appointment, Judge Oeffler served as Assistant County Attorney in Jefferson County for twelve years. Judge Oeffler states that community service is an important aspect of her role as judge. Being part of the community provides a better perspective of the community and keeps a judge grounded. Last year, she participated in a “speed mentoring” program with law students at the Ralph Carr Judicial Center. Each year she volunteers to act as a judge in the High School Mock Trial competition. 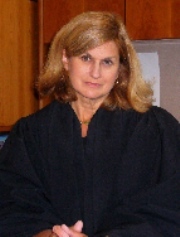 Judge Oeffler received her undergraduate degree from Muhlenberg College and her law degree from Dickinson School of Law. The Commission reviewed the 2013 interim survey scores for Judge Oeffler, and found that her performance continues to display judicial fairness and impartiality toward all parties. The Commission reviewed her self-evaluation, conducted a personal interview with Judge Oeffler, reviewed opinions she authored, and observed her in court. The Commission considered responses to anonymous surveys sent to attorneys and non-attorneys, who had been in Judge Oeffler’s courtroom. Of attorneys responding to the survey, 88% recommended to retain, 7% not to retain, and 5% made no recommendation regarding retention. Of non-attorneys responding to the survey, 88% recommended to retain, 5% not to retain, and 7% made no recommendation regarding retention. These scores are compared to all district judges standing for retention this election cycle. Judge Oeffler has presided over Criminal, Civil and Domestic Relations cases. She has been assigned to take over Probate Court when Chief Judge Munsinger retires. One aspect of her new assignment will involve presiding over multiple adult mental health cases. She has been preparing for this new assignment by sitting in on Judge Munsinger’s probate docket. The Commission complimented Judge Oeffler for her willingness to take on these complex issues that arise out of probate cases. Based on survey data, personal observations by Commission members, and comments received from attorneys and non-attorneys, the Commission found that Judge Oeffler was well prepared, listened intently through the proceedings, made fair and thoughtful rulings, and exhibited excellent judicial demeanor. There were no significant weaknesses noted in Judge Oeffler’s performance, other than that some thought her rulings tended to favor the prosecution. Based on these findings, the Commission unanimously recommends that Judge Oeffler BE RETAINED.